You can say about Liefeld what you want, but he, Portacio, Lee, and Silvestri are beasts. I miss a lot of these qualities in modern titels. That’s interesting because I feel opposite about that. I love the way artist like McNiven, Cheung and Cabal draw much more epically and realistically. And artist like Allred, Martin, and McKelvie are wayyyy more stylish and dynamic. McKelvie literally is who I want to draw real life with the way he styles people. Lee and company’s art was more dramatic and superhero-y though. But I hate Portacio and 90s Silvestri though. Now you see why it can never work with us two. I got my touch-ups done the other day! Filled in the Earth up in the sky - I wanted to keep with the green-ish color scheme and also still make it look like AN Earth, if not a planet. Still undecided if I like it, and would really love feedback from you all about how Earth/the planet looks, and how to improve it if I need to. The tattoo bug has absolutely bit me lol. I already want another one, but no idea what I'd get! I'll post more of this in another couple of weeks once the scabbing has died down and it's all settled in. And come on all you inked folk! 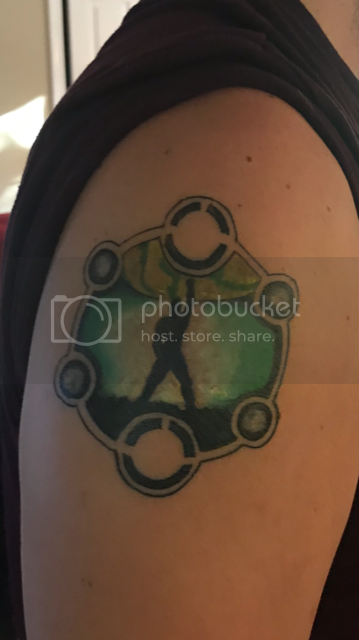 Show us your tattoos!! I aint got any. I'm like a unicorn among my friend group. Whoohoo anti, I haven’t seen the post yesterday. Looks great, and it doesn’t matter if it is earth or any other planet. It looks mysterious and I can’t wait to see the more of the progress. Have you already come up with icons for the two circles? It is just an idea that popped out right now of my mind: the icons for earth or your designated planet, and your zodiac sign. Or earth and moon icon, sun and moon,.. Thank you! I do have some ideas for the two circles, and some ideas about expanding it out to look like the Universal Machine. But that won't come for a while, if it comes at all. I wanna sit with this for a few months before even thinking about expanding it. You have to show Hickmann the result. This is listed as his homepage. I am at my iPad right now so I don’t know if there is a flash application running. How is your tattoo doing, Anti? Although I am not the biggest Zelda fan, I find this triforce pic hot. 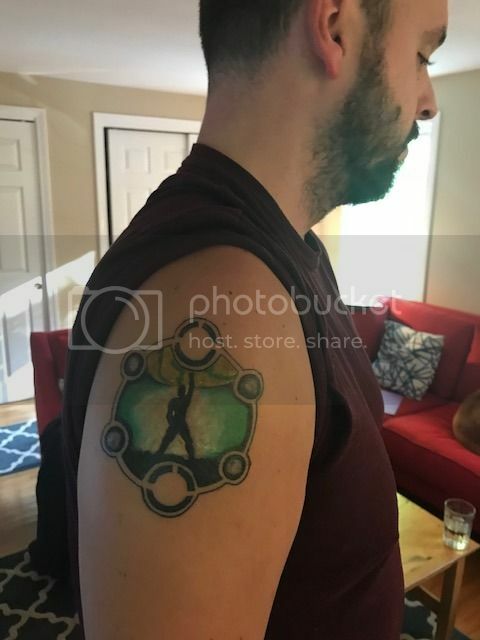 The Triforce plus the icons for strength, wisdom, and courage.